5793 labyrinths found. Showing 5721-5740. Sorted by country, state, city, then zip/postal code. 2 miles from the heart of Sister Bay off Hwy ZZ on North Bay Rd. The labyrinth is in the memorial garden on the side of the library. There is a sign: "Garden open dawn to dusk"
The Healing Labyrinth is located in Stevens Point Sculpture Park. There are rolled gravel paths that connect the labyrinth to over 30 sculptures in the park. The labyrinth is cross between a classical/medeival design and has a tree and circular bench in the center. Sunrise through sunset, 365 days a year. 41.5465 N° Lat. ; 89.5845 W° Long. In the courtyard at the medical center. Located south of the driveway entering the property. Open whenever the ground isn't snow covered. Please contact first. Four miles south of Waupaca off US 10 on State Hwy 22. Turn East off 22 onto Rural Road and go straight to first large white house on the right which is our 1853 Farmstead B&B. We try to keep it open in snow. Use of the labyrinth is free but we ask you to register at the Inn. 44.3 N° Lat. ; 89.2 W° Long. The UU church is in downtown Wausau, at the NE corner of 5th St. and Grant. 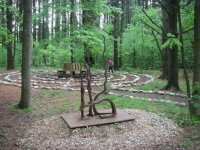 Our labyrinth is available on the first Friday of every month from 12:00 noon until 4:00pm, and from 4:00pm until 6:00pm, and then on the next day (Saturday after the first Friday) from 3:30 pm to 6:00pm. Modified Chartres-style labyrinth, with 7 circuits. Currently we are in the process of selling our property and do not know were we will be in the near future. 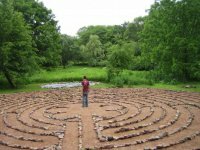 Our labyrinth is done on a canvas and can be leased. Located within Hartung Park, off Keefe Street & Menomonee River Pkwy. 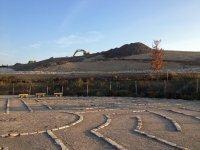 Located in Regner Park, The labyrinth is 90 feet in diameter and consists of a carefully planted selection of bulbs, perennials, herbs and annuals. Follow the winding path of the labyrinth will take you to the center of the circle and eventually back out again. It is a beautiful work of art that can be actively enjoyed. Exit Highway 39 at exit 113. Turn left into Westfield. Turn right toward McDonalds and follow the street to first stop sign. Turn right on County Road M and go 1/2 mile to the High School. Turn into the main parking lot and you will find the labyrinth on the North Side of the school. Available after school hours or on weekends. Buryat Country Retreat Center is a Baha'i-inspired center offering regular workshops on various topics of self-development. It is named after the Siberian tribe called Buryat, the ethnic background of the owner family. Acre size with sculptures and natural prairie plantings.